Let the Silver Muse take you on this Mediterranean voyage in style. Leave Monte Carlo, to see the Ionian and Adriatic waters mingling at Santa Maria di Leuca - where exquisite natural caves arch over glowing turquoise waters. 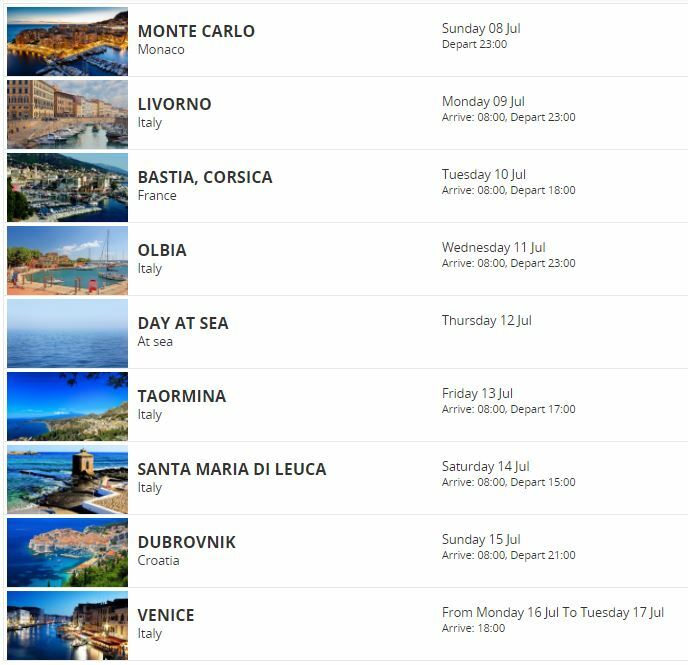 You’ll also drop in on Corsica and Sardinia - and see the godfather of Italian destinations at Sicily - before this luxurious jaunt comes to a fitting climax on the otherworldly waterways, and charming backstreets of Venice. Fares for the Classic Veranda Suite begin at $6,500 per person. The Classic Veranda Suite provides generous living space for up to 3 voyagers. Located lower bow, the Classic Veranda Suite offers all the comfort and attention to detail that you can expect aboard — both inside and out. A generous expanse of interior comforts — elegant décor, stunning marble bathroom and ample seating area, make this a cosy home away from home. But perhaps this suite’s finest asset lies just outside, as floor-to-ceiling glass doors open onto a private veranda, making every sunset feel as if it is yours alone.